Details Make our Doors Different! 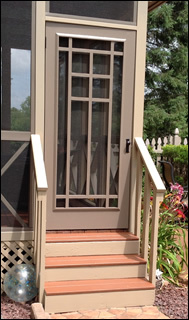 Our Lifetime, Solid Wood Screen & Storm Doors are traditional and practical! Timeless designs, quality construction, and our attention to detail ensure lasting value and appeal. We handcraft each Door to your exact size for at least a lifetime of use and enjoyment, including the quality features listed below. • PREMIUM 1-1/8" THICK, kiln-dried, solid wood door frames (no finger joints) with 1" thick solid wood decorative components. 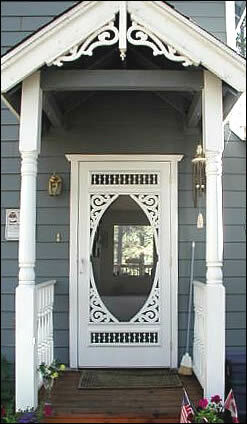 • RAISED FRONT and BACK MOULDINGS duplicate those found on the most expensive entry doors. Together these mouldings add about 1" to the door thickness for an overall thickness of 2-1/8". • MORTISE & TENON FRAME JOINTS with lock-pin construction! Wooden lock-pins (like those found in the very finest furniture) assure it is nearly impossible for our door frames to separate, as each frame joint is quite literally locked into place! 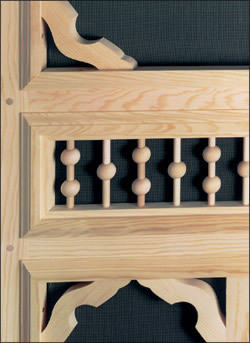 • SCREEN PANELS (included) fit snugly behind decorative back mouldings. Secured by brass screws, these back mouldings neatly cover the metal frames of the screen panels. 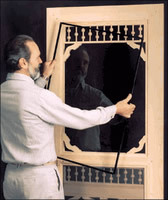 Replacement screen panels are locally available, since we use standard construction for our screen panels. The possibilities for unique styles (including custom designs) and various locations and uses are endless. 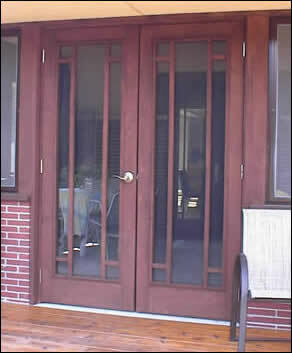 A pair of Doors #7117 create a beautiful Arts & Crafts style double door entry from this deck. 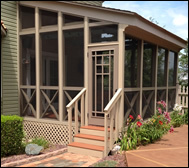 We gladly guarantee each Screen/Storm Door against joint failure for 20 years of normal residential use if an adequate protective finish is maintained. However, if kept well painted, your door should actually last at least a lifetime... a lifetime of beauty and usefulness... a lifetime of openings and closings, even by little children! 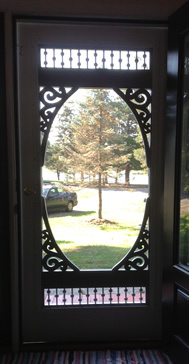 If damage to the bottom screened portion is a possibility (due to kids or pets), order a door with a center push bar. This separates your screen/glass areas into two sections. 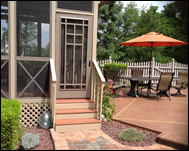 You can leave the bottom glass in all year to protect the door from damage while still enjoying the breeze through the top screened section! Customer Comments “I was impressed by the thickness of the wood and the catalogue didn’t do it [my door] justice! You appear to be committed to excellence." "Here are some pics of my recent project. Thanks for everything." Browse photo examples of many of these ideas on our website. Also, see Additional Photos and Detail Photos. View our Doors by style, but don't feel limited by what's shown. You can always contact us about custom designs or slight modifications to one of our designs.